The fee students are charged will depend on their nationality, immigration status, where they have been living and what they have been doing prior to the start of their course. The ‘Home Rate’ is set by the Scottish Funding Council (SFC). The ‘RUK’ (Rest of the UK) fee and ‘International’ fee is set by College. Home Rate Students who have been resident in Scotland or EU member country (except England, Wales or Northern Ireland) for more than 1 year. RUK Student whose main residence is in England, Wales or Northern Ireland. They have relocated to Scotland for educational purposes. International Students who are resident in all other countries outwith the EU member countries. To claim residency in Scotland the student must have been resident for more than 3 years on the start date of the course, this excludes any previous period of residency for educational purposes. Even if the student has been living in the EU they are unlikely to qualify for fees at the Home Rate if they need a time limited visa to live in the UK. The Scottish Government have introduced a new provision for student support for Scottish domiciled students meeting a new ‘long residence rule’ from 1st August 2017. Students who are not regarded as being settled in the UK in line with the current residency criteria but have been resident in the UK for a significant period of their lives, are to be assessed as ‘home’ students for fee purposes. These students are now able to apply to the appropriate funding body for tuition fee and/or living-cost support assuming they meet the other eligibility requirements (listed below). (iii) Aged 18 years old or above and, preceding the relevant date, has lived in the United Kingdom throughout either half his or her life or a period of twenty years. Payment can be made at any campus finance office by credit card, cash or cheque. Fees are payable in advance of the course start date. Where fees are not paid in accordance with College policy, the College will send reminder letters, failing which, the College reserves the right to initiate debt recovery action. The College also reserves the right to withhold Certificates and Results of Students who haven’t paid their fees in full by the end of the respective academic session. If you are a student in Higher Education (HNC or HND) you should visit the undergraduate section of the SAAS (Student Award Agency for Scotland) website or call on 0300 555 0505 to make an application for funding. This should be completed at your earliest convenience prior to the start of your course to ensure your application is processed in time for you commencing your studies. You should note that if you do not apply to SAAS or if they deem you ineligible for support – which may be on the grounds of residence or previous study – you are liable for the payment of fees and will be invoiced in full by the college. 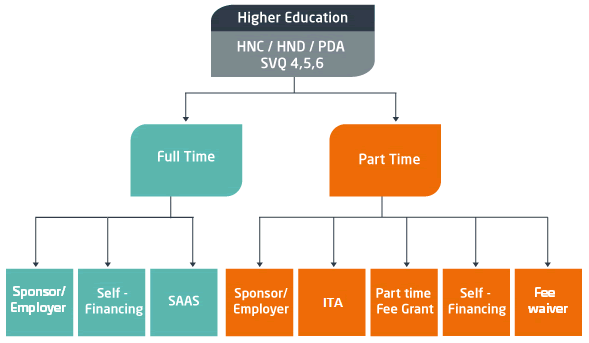 SAAS pays the tuition fee direct to the College for all eligible students. Where a student withdraws or drops out before 1st December, the student will not be invoiced for any fees. If your main residence is in England, Wales or Ireland your fee status for tuition fees will be RUK. The amount of this fee is in line with our International rates and not the home rate. If you have any queries regarding this please contact sales.ledger@wcs.ac.uk for more information. All Further Education (FE) / Higher Education (HE) self-financing students will be requested to provide proof of Scottish residency for 1 year to be eligible for home rate fees (see Tuition Fee Policy for rates). All course fees under the value of £200 must be paid in full before the start date of the course. Courses fees over £200 may be paid in monthly instalments on completion of a payment plan by way of standing order at the time of course booking. A standing order mandate should be requested from Finance for completion of bank details and to be signed. A minimum monthly payment of £50 is required and full payment must be completed no later than one month prior to the end of the course. Monthly payment terms and duration will vary dependent upon course type and/or length. 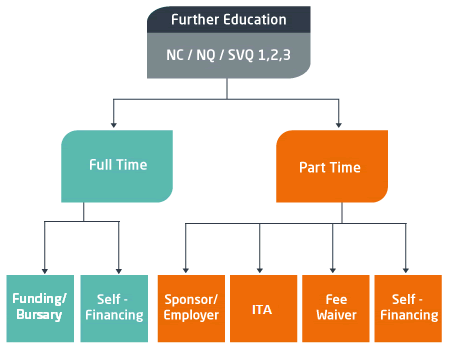 This scheme is not available to International students or short commercial courses, which need to be paid in advance of course commencement. if the student withdraws from a course in line with the withdrawals general practice. Refunds will be paid by BACS. In exceptional circumstances, the Head of Sector will have discretion to award a refund, even if the student has not attended. For all refunds, the Head of Sector must approve the documentation to be provided to Finance. In exceptional circumstances, the Head of Sector will have discretion to award a full refund, e.g. sickness. If you are eligible for ITA funding, you are entitled to funding of up to £200 per year towards training. Under the current ITA scheme you can submit only one application in any learner year, and that any courses undertaken will be in direct support of your career progression. Please submit proof of ID and income direct to us at ITA@wcs.ac.uk. Part Time Fee Grants may be available for students earning up to £25,000 who are undertaking a part time HNC or HND course. Please visit the undergraduate section of the SAAS (Student Award Agency for Scotland) website or call on 0300 555 0505 to make an application for funding. This should be completed at your earliest convenience prior to the start of your course to ensure your application is processed in time for you commencing your studies. Students who are not in possession of their SAAS award letter at the start of their course will be liable for full fees. Refunds or revised arrangements will be made upon presentation of SAAS award letter. Students must submit their application to SAAS no later than six calendar months after the course starts. PTFG Application Forms can be downloaded from here. If your employer/Sponsor is paying your fees please submit a letter from your Organisation on company headed paper. The letter must state your name, course details and be signed by an appropriate authorised member of staff. An invoice will then be sent direct to your employer/sponsor. Please note employer/sponsor letters must be submitted within 2 weeks of enrolment otherwise the student will be invoiced directly.